Help Sell Tickets for the Parish Picnic & School Reunion! 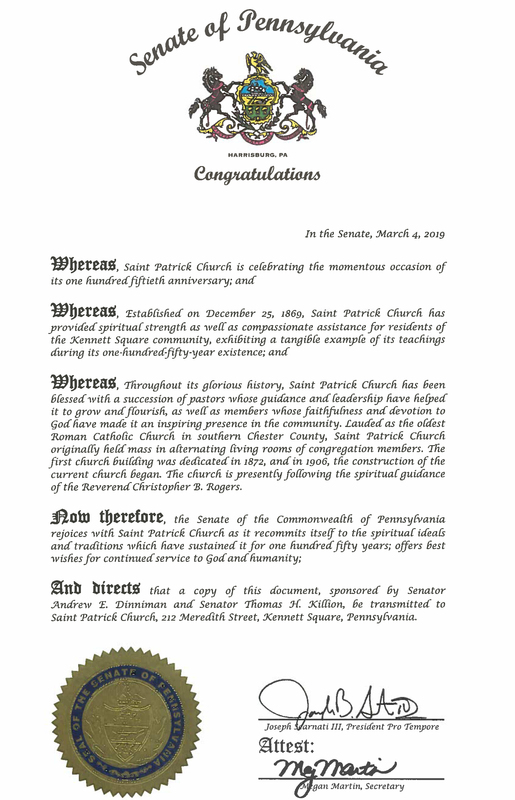 Congratulations from the PA Senate to St. Patrick’s! 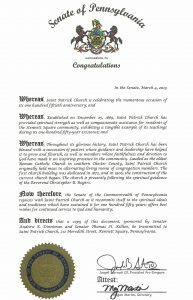 Saint Patrick Church is proud and grateful to share that we have received an official citation from the Senate of Pennsylvania congratulating us on our momentous Jubilee Year! Click the image to the left to read the full citation. 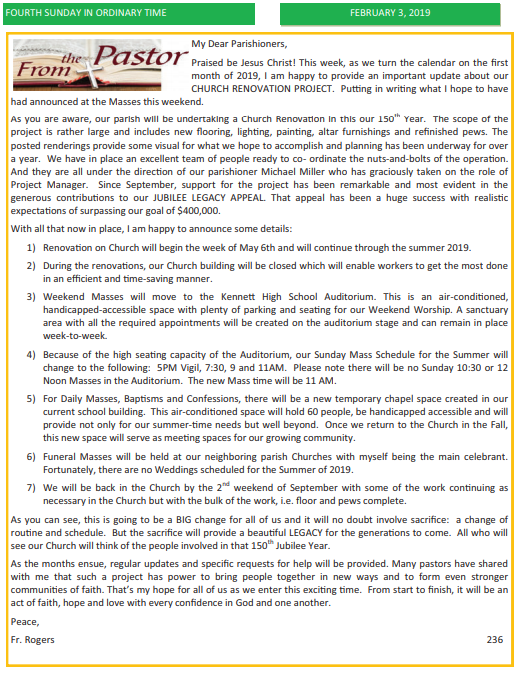 Beginning May 11/12, our Church will be closed for renovations. Weekend Masses will be held at Kennett High School Auditorium and the Mass Schedule will be as follows: 5 PM Vigil on Saturdays; 7:30 AM, 9 AM and 11 AM on Sundays. Be sure to read Father Rogers’s letter from February 3, 2019 regarding full details about the upcoming Church Renovations. Click here to learn more! What are you doing this Lent? Participate in Stations of the Cross each Friday during Lent. Stations starts at 7:00 PM in the church. bring your food in the Giant paper bag inserted into the reusable bag. When you drop off the food, you will be able to keep the reusable bag. In addition, KACS is always in need of funds to purchase meat and fresh produce, so checks and cash are always welcome! 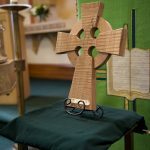 If you are a registered parishioner of St. Patrick Parish and have a child attending one of the following schools: Assumption BVM, St. Agnes, St. Cornelius, St. Maximilian Kolbe, or St. Thomas for the 2019-2020 school year, please submit your request for a subsidy. 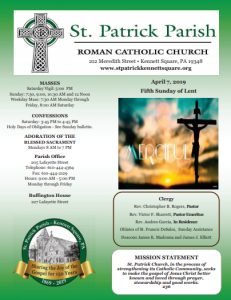 Mail your request to the parish office at 205 Lafayee Street, Kenne Square, PA 19348 by April 30, 2019. You are cordially invited to the St. Patrick Parish Jubilee Year Golf Outing! Mark your calendar for Monday, May 6, 2019 and plan to join us on the fabulous Kennett Square Golf Course. CLICK HERE TO REGISTER AND PAY ONLINE!Consider becoming an event sponsor, hole sponsor, or advertising in the program, in addition to golfing with us! Dinner guests are also welcome. Click here to learn more. Thank you to all who have responded so far to our special appeal. The response has been terrific. As of January 28, 2019, $301,852.00 of $400,000 has been raised! Visit here for more information. Various committees continue to plan activities in anticipation of the parish Jubilee celebration in 2019. As we develop these plans, we find that we need additional help in two important areas: Liturgical Celebrations and Community Social Activities. Both of these committees are looking at a number of events to be held throughout the Jubilee year. Additional volunteers are needed now to help develop these events for the parish. No previous experience is necessary – just a willingness to help. If you are interested and would like to participate, everyone is welcome. Please contact Candy in the parish office at 610-444-4364.